World-class athlete and waterskiing legend, Pierre Plouffe has won the Canadian Water Ski Championships in jumps, figures and combined in his category 27 times. Crowned Coach of the Year in Canada in 1988, he was also inducted into the Quebec Sports Hall of Fame in November 2000. Having put a hold on his career since 1989, Pierre decided to start competing again in 2006. He has since won three World Championships in combined disciplines (2008, 2010 and 2012). Senior Canadian National Champion in slalom, jumps and combined figures since 2006, Pierre’s goal is to win the next World Championships in 2016. I stopped competing in 1989 because I could not see the challenge anymore. Starting over, not much has really changed from when I was competing in the 80s. The equipment is different, but the competition is the same. The only difference is that now my challenge is to continue as long as my body can keep up. I started up again for my health. Instead of following a severe and unpleasant nutritional diet to control cholesterol and diabetes, I decided to invest myself 100% in physical activities. That way I get to spend my energy on the lake and eat what I want! Competition came naturally. If I was to start giving my all to a sport, why not aim for a goal. Being named Athlete Ambassador is truly a great pleasure. Tremblant for me is not only the best place, is the only place to live. It is an absolutely amazing playground. 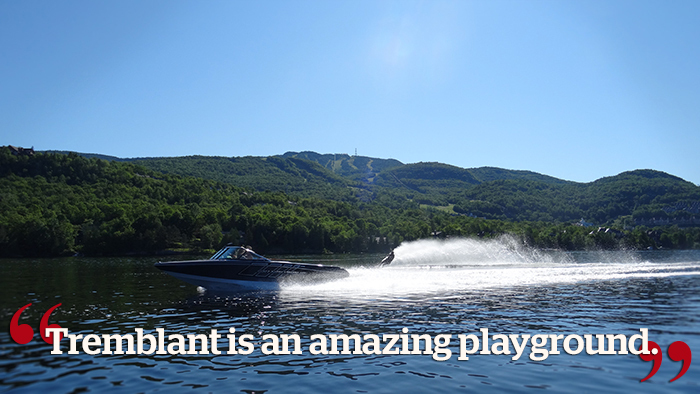 I’ve traveled a lot and believe me when I say that Tremblant is incomparable. From water skiing to alpine skiing, biking to tennis, sailing to golf… You can have fun outside at all times. And all this within a radius of about 1 kilometre! So for me, being nominated to represent Tremblant is a great honor. I was moved. It’s like winning a prize that’s really dear to my heart. I hope with this title I can influence more people to come and enjoy everything that we have to offer. The strength of the Centre Nautique comes from the lake as much as the employees. It’s thanks to them that I’m still here after 22 years! We’re also always looking to adapt to new demands and a changing array of clients. For us, security is a main objective and people come back because they know they’re having fun in a safe environment. 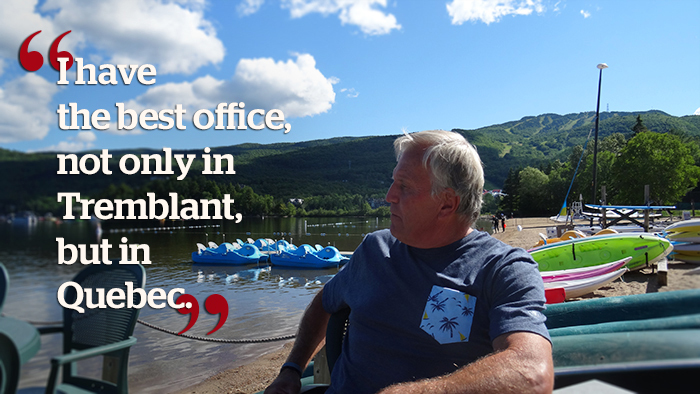 I often say I have the best office, not only in Tremblant but in Quebec. What can be more enjoyable then taking your coffee by Lac Tremblant every morning?